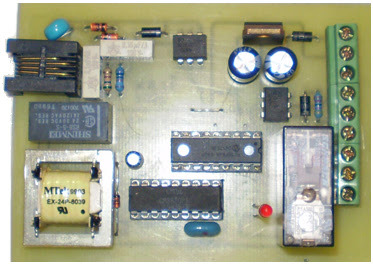 The task was to build a device that connects to the phone line and has a relay as an output switch. It should also sense if the connected «consumer» is turned-on or off and report to the administrator at the other end of the phone line. The administrator would then call-in the device, log in with the password, and check the state of «consumer», turn it on or off, change password or some other settings. Current version has only one relay. The administrator should call-in the device from another telephone. After a few (configurable amount of) rings, the controller will pick-up the line and answer with a beep. After the beep the administrator must enter 4-digit password onto the keypad of his phone (DTMF). This must be done in 6 seconds. If the password is not entered in 6 seconds or wrong password has been entered, the device will beep and hang up. You can call it again now. After the password has been successfully entered, you will hear two beeps or three beeps. Two beeps means that the «consumer» is turned on (detected with «sense-input» if controller configured for «pulse-mode») or that the relay is turned on (if controller configured for «switch-mode»). Three beeps means that the «consumer» or the relay is turned off. After pressing 1 or 0 the relay will do it’s job and you will hear two or three beeps after it has finished pulsing or turning on or off the relay. We know what those two or three beeps stand for from above. After pressing the pound key (#) the controller will hang-up. After entering any of those options you will hear that-many long beeps and a short one. For example: If you press setup option 3, you will hear beeep-beeep-beeep-beep indicating that you entered setup option 3 (those 3 long beeps). After entering an actual value in setup option, you will hear a short confirmation beep, followed by those two long beeps from entering the setup. Now we are back at the beginning of the setup and can choose again from the setup options above. The device will remember the relay state even after power-down. When the power get’s back on it will put the relay into previous state before the power was lost. There is also a timeout timer so that if you hang-up before the controller, it will keep the phone line occupied for about 35 sec and than hang-up.